I am always worried when I see a child or group of children sizing up a book with a pair of safety scissors! Firstly because we live in a world dominated by health and safety rules and regulations and secondly because I have always kept my books in pristine condition. 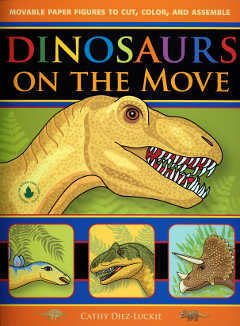 However, ‘Dinosaurs on the Move’ begs to be cut up! It is super book to look at, from cover to cover, with cleanly drawn and beautifully coloured illustrations of nine dinosaurs and one of Pteranodon. Only nine dinosaurs I hear you say. Yes but the end product is nine dinosaurs that come to life in your hands. The first four pages of the books are dedicated to descriptions of the various animals you will later cut and paste. The descriptions are short but carefully written and present the majority of key facts on Allosaurus, Ankylosaurus, Baryonyx, Brachiosaurus, Ouranosaurus, Parasaurolophus, Pteranodon, Stegosaurus, Triceratops and Tyrannosaurus rex. After that there are two pages for each animal one in colour the other with line drawings. Both sets of pages can be removed easily as the lightweight card is perforated along the length of the bound margin. For those of you good at colouring you need only to extract the pages with line drawings for younger children (and parents) you can take out the colour pages and enhance the quality and impact of the final product. Once you have decided on colour or black and white and extracted the pages you can turn to the inside back cover and follow the simple instructions. Taking Allosaurus as an example, simply cut round each of the 16 body shapes, colour in if necessary and then use a small punch (1/8th) to cut the holes clearly marked on the head, jaw, limbs and body parts. On the back of each part capital letters tell you which parts can be fitted to each other with brass fasteners. The result is an articulated model of Allosaurus and hours of fun and learning.